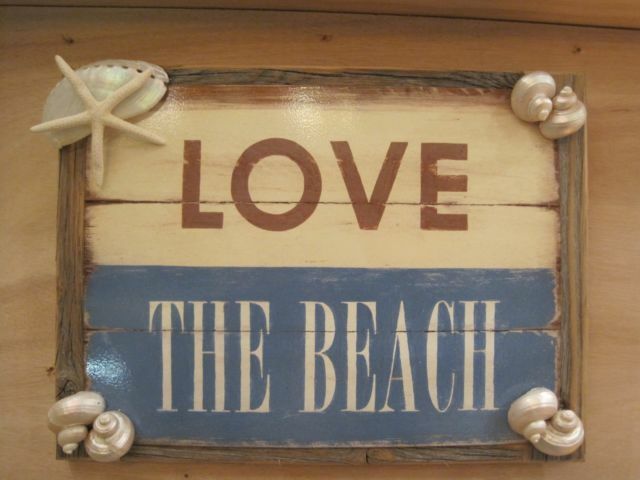 What a fabulous sign that sums it all up – LOVE THE BEACH! This very cool metal and wood sign makes that very accurate statement that kind of is blunt and to the point, but oh so true!! To make it extra special with that real seaside touch, I’ve added a fun gathering of the day’s seashell finds to the corners: beautiful pearled and polished turbos, a white abalone and a white finger starfish. Very beachy! The very shabby chic combo of a metal sign mounted on heavy, distressed and weathered wood makes this awesome sign especially appealing! 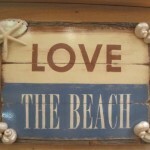 It has a two tone background of creamy white and a seaside medium blue onto which the print lettering is written (Love in soft brown and The Beach in white). The metal part of the sign looks like a piece of distressed wood and is mounted on a 100% solid, heavy rustic, weathered wood – sturdy and durable! The sign has a sawtooth hanger on the back for easy hanging. The sign measures 13 1/4 long by 9 3/4 wide and approx. 1/4 inch deep.